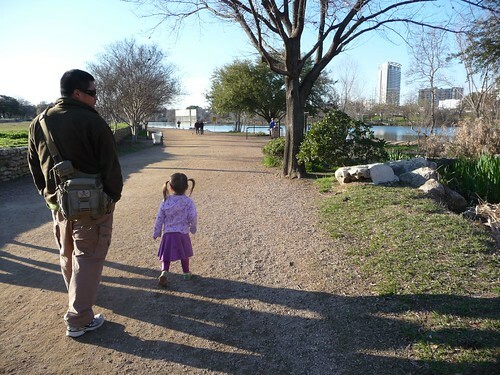 Mali Mish – Day 21: Shopping and bat searching in Austin. 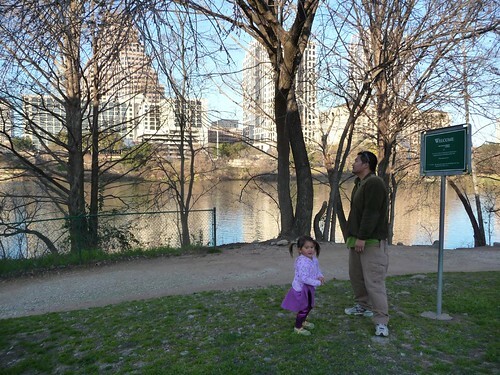 Our second full day in Austin started out with clear skies and much warmer weather. Thanks to the snow from yesterday, I found out that one of our old college friends Missy now live in Austin from her status update on Facebook. 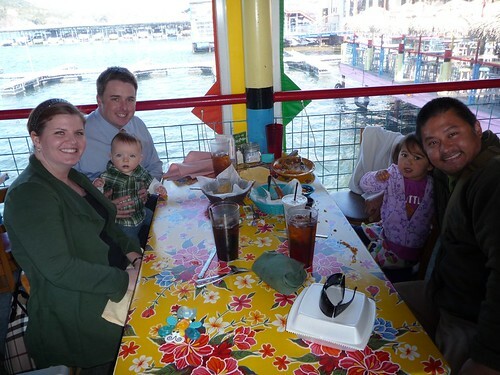 To both of our delight, we arranged to meet for a nice lunch at the Hula Hut right on Lake Austin with her 8 month old boy Liam and her husband Conor. We realized that we probably had not seen each other for well over 10 years. They have only been living in Austin for less than a year since moving out from San Diego. It took us driving all the way to Texas to finally reconnect. It was really nice to see familiar faces in far away places. It’s not that Austin is really that weird, it’s just weird for being in the middle of Texas. 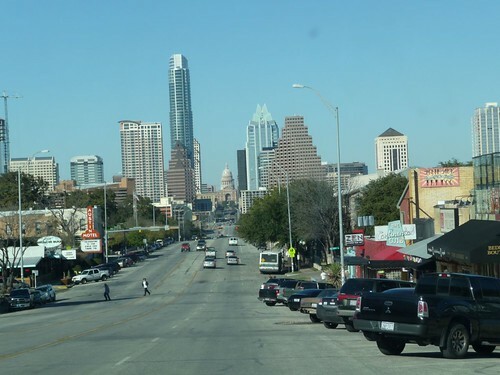 A lot of people like to say that Austin is is a splash of blue in a predominantly very red state. And that nails it right in the head. 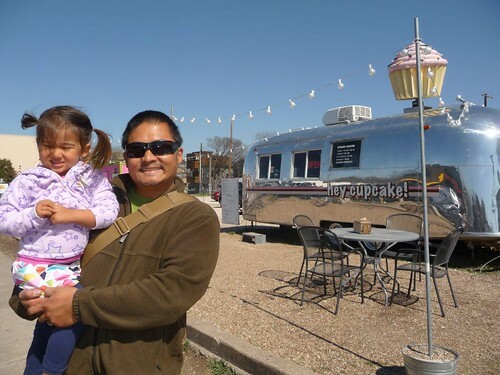 SoCo is known for a lot of things but one that we have heard a lot about before coming here is the Airstream cup cake shop called Hey Cupcake. 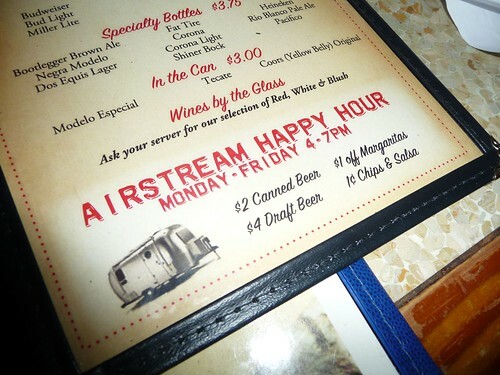 Austin has an unhealthy obsession with Airstreams. It’s like that friend who is always wearing a different scarf. She has a closet full of them not because her neck gets cold but because its kind of hip and she likes the way they look. Since no one else gets hurt by it so we just let her be. Everywhere we look, there is an Airstream posing as something else. A dog shelter, a donut shop, a snow cone shop, a restroom at a restaurant and even a law office were spotted covered in the fame aluminum sheeting during just a few brief tours around town. 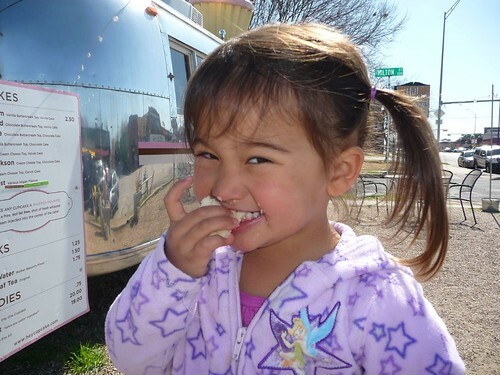 Here is Ava ready to partake in the Airstream cupcake goodness. Since coming to Texas, Marlene has been wanting to get some authentic cowboy boots. Little did she know that such item is viewed as an investment, and unfortunately, also priced as such. 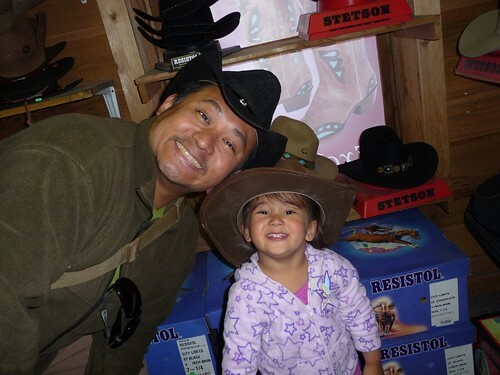 We were not quite ready to drop $500 to $3000 for a pair of boots, so we retreated to the accessory section of the store and tried on cowboy hats. Guess what, they actually have hats that fit our big domes. How to look good wearing one on the other hand is a whole other story. This was a special day for Ava. 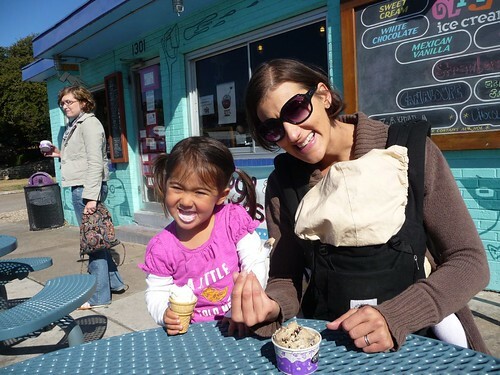 Not only did she have a cupcake, she also got to have ice cream. Amy’s ice cream to be exact. This is the same ice cream that were served ala mode on our pecan pie yesterday and it was delicious. 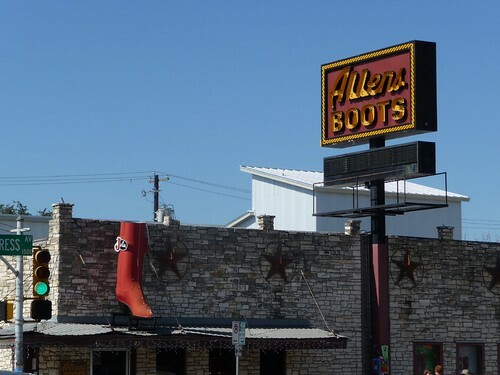 We did not want to leave SoCo empty handed since Allen Boots didn’t quite fit into our budget. 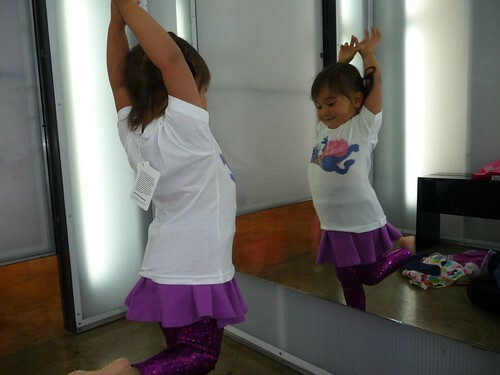 We walked into an American Apparel store and Ava picked out some new clothes to try on. For those who don’t know about American Apparel, they are based in LA. The head quarter is probably within an hours drive from our house. We came to Austin and all we got to show for is a pink skirt that got here in a truck from CA probably just a few days ago. Well, she does really like it. Look at this Olivia Newton John pose she is busting out in the dressing room. Aside from the skirt, the outfit she picked out is exactly what the little kid mannequin is wearing in the window display. 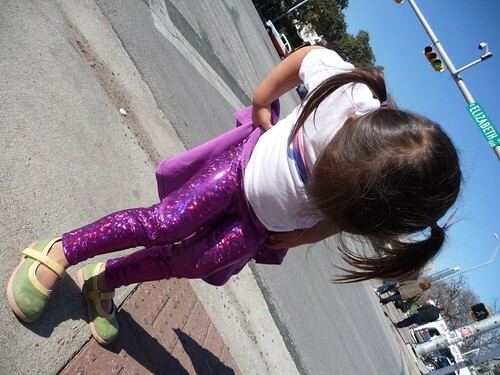 Check out the shiny Ziggy Stardust pattern on those tights! 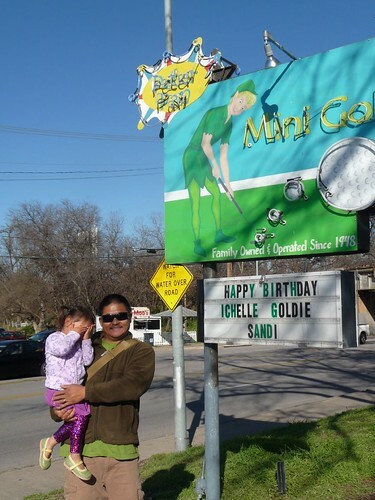 On our way back from SoCo, we stopped real quick at this funky miniature golf place right up the street from Pecan Grove RV Park. It is a Peter Pan themed mini golf course and since Ava is really into the Peter Pan movie right now so we stop quickly for a little photo op. We didn’t have time to play a round of golf as it was close to dusk and Marlene had bats on her mind. Austin is home to the world’s largest urban colony of bats in the world. 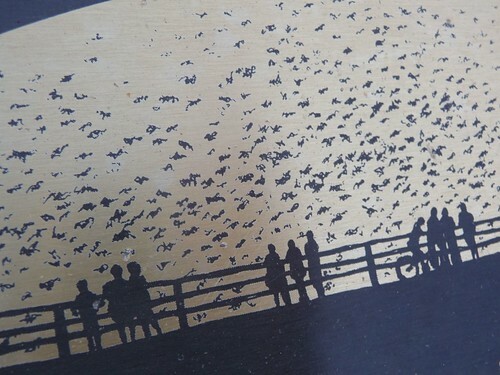 Between the months March through September, the bats migrate from Mexico and live under the bridge. 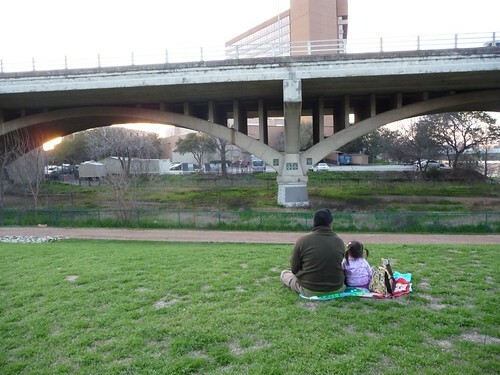 There are an estimated 1.5 million of them that sleep in the seams of the concrete under the Congress Avenue Bridge at the peak of the season. Since we are a few weeks early before the season actually starts, we didn’t know if there would be any bats already there. Coupled with the temperature being sub freezing in the last few days, we didn’t really have high hopes. 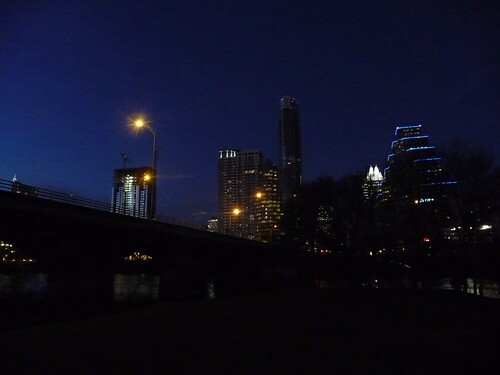 The bats sleep under the bridge during the day and at dusk, they all come out at the same time to feed on insects around the city of Austin. It is estimated that they eat between 10,000 to 30,000 lbs of insects each night. I would not want to imagine what Austin would be like without these creatures eating up all the mosquitos. We crossed out fingers and waited to dusk to see if we could see any of them bats. It got dark and it got cold, but no bats. Hopefully we will come through Austin again on our way home to catch these flying rodents in action. Being cold and hungry, we headed back to Pecan Grove and visited another near by restaurant called Shady Grove. And guess what, they too like using Airstreams in their decor. Surprise, surprise! Thanks for coming along with us on our short visit to Austin. Tomorrow we head out toward the Gulf Coast! One Response to Day 21: Shopping and bat searching in Austin. I got to see the bats when I was in Austin a few years ago. I also noticed all the Airstreams but of course, how can you miss them? Reading through this post was like visiting Austin again. BTW, I so much appreciate the honesty around traveling with little ones. it’s not all rainbows and sunshine but definitely worth it. Thank you for sharing all of this!